I have a HP Pavilion dv4-1101tu notebook. Currently it is running on Windows 7. All devices are installed correctly with their driver softwares. 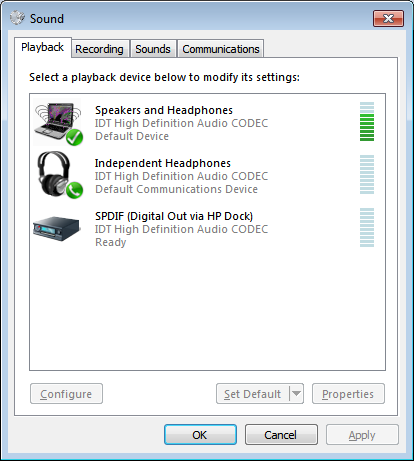 Change Windows default playback device to Independent headphones: Nothing happened. Also Windows default communication device can only be set to Speakers and Headphones. Change Skype's audio setting to Independent headphones: Both call's and audio's sound will go through the speaker. The default setting is Speakers and Headphones. Change settings in IDT Audio Control Panel: This panel does not allow me to change default playback device to my headphone. Disable the speaker: No audio's sound anymore. You can change default device as well as default communication device to headphones. That should take care of it. I think that you're telling the computer to only use the headphone for communications applications. When the headphones are plugged into the jack, the logic still outputs sound from applications like WMP and youTube to the speakers, because the headphone jack is reserved for communications applications like VoIP. I think that if you disable the headphones, the sound will play through the jack (and therefore the headphones) because the OS will release the jack to any sound playing app, not just communications...that's my theory. One other option to check... I use a IBM/Lenovo laptop, and I was getting a similar problem on my system where certain apps would play in the headphones and others would go through the built in speakers; even if the headphones were plugged in. The internal sound card in my laptop is provided by Conexant. I found that outside of the standard Microsoft "Audio" control panel, Conexant also provided another control panel called "Smart Audio" that I hadn't noticed before. Upon reviewing that control panel, there was a "Audio Director" setting labeled as "Classic" or "Multi-Stream". Mine was set to Multi-Stream, so it allowed some audio to go to the internal speakers, and some to my headphones, but when I set it back to Classic, all the audio moved to the headphones when they are present. I think that's what your looking for. You might see if HP has a similar software driver that is allowing Multi-Stream audio on your system. Hope that helps! Check again, which the output of the sound goes, and Sn'P (shrug and pray). The IDT panel DOES NOT allow you to select the headphones as the default device. I never had this problem until recently. I plug an external speaker in through the headphone jack and the sound remains coming out of the internal laptop speakers. Aggravating when trying to watch a movie. I would reinstall the IDT driver from HP and it would work after a reboot. That takes a lot of time when what one intended to do was start watching a movie. Today I stopped the Windows Audio Service. Then I stopped the Windows Audio Endpoint Builder Service. Then I restarted the Windows Audio Endpoint Builder Service followed by restarting the Windows Audio Service. This put things back to normal. External speaker plugged in and the internal speaker shut off. First, have you checked your Skype audio settings? Skype has the final say as to where its audio/video feeds go. This is so that you can set your system audio to your speakers, such as a game or video, but have a Skype call sent to the headphones so that it remains private and doesn't affect the other applications. Second, you can right click on the speakers in the audio settings and select disable. This will force the audio to your headphones. Note: you will have to reverse this change when you are done. It might be the multistreaming option. On most modern HP systems it's in the Beats Audio settings. Skype appears to turn it on, which breaks the laptop's ability to redirect all sound to the headphones when they are plugged in. On an HP system go to your Beats Audio settings by simply right clicking on the beats audio icon in the task tray and click the 'open audio control panel'. Go to "advanced settings" and turn off multistreaming. Problem solved. Make sure the speakers on your laptop are set as BOTH the default device and the default communications device. The audio drivers will automatically redirect ALL sound to your earphones/headphones when they are plugged in set this way. If you set the earphones as the default communications device only programs using that setting will come through the earphones. Not the answer you're looking for? Browse other questions tagged windows-7 laptop audio skype speakers or ask your own question. how do I make my computer only play through my speaker even if headphones are plugged in?